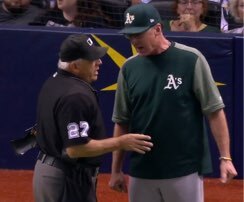 HP Umpire Larry Vanover ejected A's Manager Bob Melvin (strike three call; QOCN) in the top of the 8th inning of the Athletics-Rays game. With one out and the bases loaded, A's batter Marcus Semien took a 2-2 slider from Rays pitcher Vidal Nuno for a called third strike. Replays indicate the pitch was located off the outer edge of home plate and belt-high (px 1.036, pz 2.317), the call was incorrect. * Following the inning, Semien argued the pitch with Vanover, drawing the attention of Melvin, who was subsequently ejected. Pursuant to UEFL Rule 6-2-b-5-b, the reason for ejection is the underlying strike three call that spurred Semien's initial complaint, regardless of the precise nature of Melvin's ejection. At the time of the ejection, the game was tied, 4-4. The Rays ultimately won the contest, 7-5. This is Larry Vanover (27)'s second ejection of 2018. Larry Vanover now has 1point in the UEFL Standings (3 Prev + 2 MLB - 4 Incorrect Call = 1). Crew Chief Larry Vanover now has 21 points in Crew Division (21 Previous + 0 Incorrect Call = 21). This pitch was located 1.464 horizontal inches from being deemed a correct call. This is the 166th ejection report of the 2018 MLB regular season. This is the 68th Manager ejection of 2018. This is Oakland's 2nd ejection of 2018, 5th in the AL West (LAA, HOU, TEX 5; SEA 4; OAK 2). This is Bob Melvin's 2nd ejection of 2018, 1st since July 10 (David Rackley; QOC = Y [Check Swing]). This is Larry Vanover's 2nd ejection of 2018, 1st since July 21 (Pat Roessler; QOC = Y [Balls/Strikes]).